Abstract: This thesis is an edition based on the study of a fifteenth-century Middle English manuscript containing a collection of cookery recipes as well as a miscellany of medical texts. The cookery recipes of the London, British Library’s Sloane 442 manuscript (MS Sloane 442) are the subject of the thesis, and will be presented in a diplomatic edition. The edition encompasses a codicological description of the manuscript and the hands, but also supplies the necessary background information in order to shed light on the historical and linguistic context of these medieval cookery recipes. The present thesis project investigates the vagueness notion frequently linked to the language of Middle English cookery recipes. The perceived vagueness, however, is coloured by the context of the cookery recipes: the time, the function, and the audience. The study draws upon previous research projects of similar character. In this respect Carroll’s studies of Middle English recipes are of great interest. There is to this day no knowledge of parallel texts containing the exact same contents in the same particular order of appearance as the MS Sloane 442. Consequently the cookery recipes have been studied in their own right without making comparisons with parallel texts. What concerns Middle English and the specific dialect of the manuscript, the dialect of MS Sloane 442 has been localized in A Linguistic Atlas of Late Medieval English as Linguistic Profile (LP) Essex 6021 (thus belonging to the Essex area). An in-depth study of the dialect therefore proved superfluous. Nonetheless, an outline of the history of Middle English and the linguistic variation typical of the period will be provided, thus contextualising the dialect of the manuscript. The thesis is divided in two parts of which the first includes the background material that will place the manuscript in its historical and linguistic context. 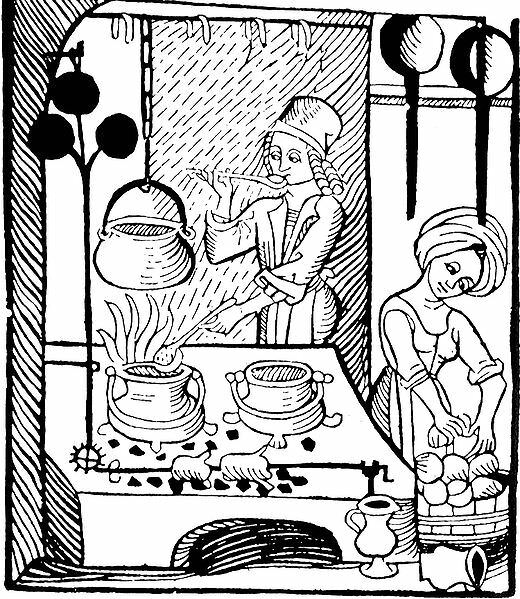 Then a general study of cookery recipes as text makes up the theoretical framework, followed by a specific study of the language of the cookery recipes in the Sloane 442 manuscript. Finally the edition, with the transcribed text and the editorial conventions, makes up the second part of the thesis. The cookery recipes have been transcribed according to the conventions of the diplomatic edtition. The intention has been to present a text that represents, as far as feasible, the layout and conventions of the original manuscript. A glossary of culinary terms has been included as an appendix. This was considered useful since the recipes consist of some culinary terms that would most likely be unfamiliar to the modern reader.